As a musician and producer, I find it truly amazing to be introduced to something new that touches my mind so intensely, I not only hear the music, but I also feel and see the music. 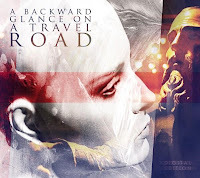 A Backward Glance on a Travel Road, or ABGOATR, is a project born of the group Hypno5e. Knowing the work of gifted, multi-instrumentalist Emmanuel Jessua and drummer Thibault Lamy, my first thoughts predicted pieces of intense, powerful progressive metal that the band Hypno5e master. I would have welcomed a new record of equivalent weight, but I was encouraged by this album’s alternative beginnings. A dark mix of progressive rock, experimental landscapes, and unique emotional texture, infused with multiple layers of ethnic styles, instrumental arrangements and moments of vocal majesty, A Backward Glance on a Travel Road is not music for your average listener. It contains some moments of heartfelt sincerity that mercilessly pull on your hearts strings, and in the same moment, can send dark, threatening visions of evil though your mind seamlessly. Without a true category which to be placed, this collection can only be looked at as beautiful unique, art form from the minds of true innovators. "Regular Barbary", hypnotic and desperate, takes some illusive vocal samples and intertwines them with colorful acoustic guitar to add a perfect level of dramatic appeal. This is beyond a song or a just a good tune. It is too grand to be attached to such a small label. A sonic painting would be a much more accurate description. The middle-eastern and Spanish influences make this piece live beyond ones hearing. The second, "Falling" expands on the same architecture and fills you with a feeling of sadness and dread, but somehow holds you comfortably as the voices sore. Again, the brush strokes paint a very powerful picture if you are listening carefully. It makes you visualize more than just listen. Threatening at times, but consistently beautiful. The classically, progressive influences come out clearly within "Johnny got his gun". It is horror, sadness, gloom, and a touching stroke of pleasurable pain set carefully between each and every one of its notes. Clearly an experimental homage to both Dalton Trumbo's 1939 novel of the same name, and Metallica's "One," the overall production, use of dynamics and chanting of "S.O.S. help me" makes a truly frightening and brilliant ending to the song. The beginning cascade of "In Absentia part 1" floats down softly, but darkly. The overall shapes and musical arrangement achieved in this composition is tight and warming. Again, it is an audible, but truly visual experience if your ears are tuned carefully. I just wanted to thank you for all these efforts. I really enjoy your music tastes !